My God! Tks for all the blessings! I'm very grateful for all the things I enjoy everyday... family, home, love, friends, work, a great hobby, health, and more. I feel beautiful and special to deserve all these. I just thought I should start saying this instead of what I usually say... But anyway... that too! Hello Friends, Happy Friday! I hope you are also feeling grateful today and that you have reasons to be happy and feel you are special. I think we all are beautiful. Here's a card I made last night to post in Friends with Flair today. You know I love Unity Stamp Co. brand. I have some stamps without any single use yet... so I try to use them all. I cut some paper strips, distressed, inked and placed in the base. I then stamped the image and colored with watercolor pencils, then cut in an irregular shape and cut other larger layers to stack into each other as shown. I used glue in the middle and 3D adhesives in all edges for the dimensional look. I love the final result and I hope you love it too. Leave a message for a chance to win with Friends with Flair. 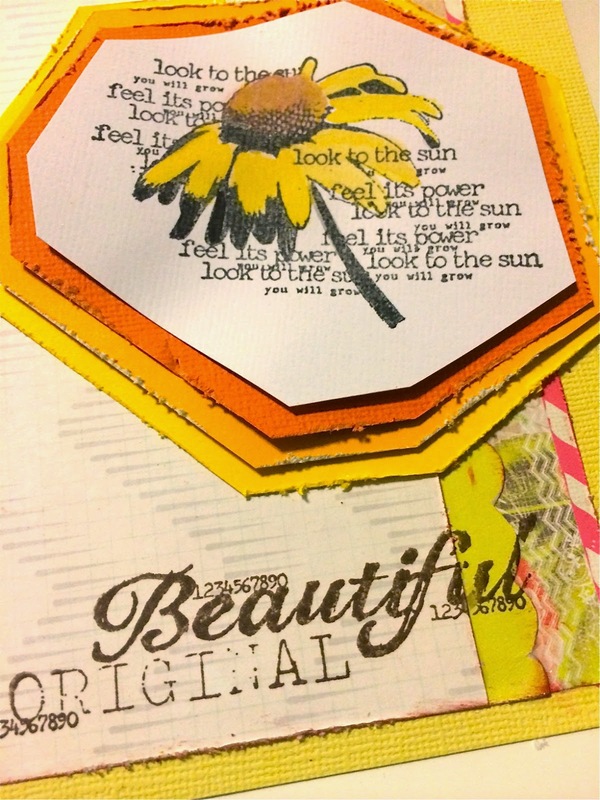 I will be attending a great scrapbooking event tomorrow... It's the Puerto Rico Scrapbook Event. Click in the name for reference. I will take classes with Teresa Collins, Frank Garcia, Vicky Boutin and Stephanie Miller. So, if you follow me in facebook, stay connected to see my posts and photos I plan to share. Love the step look of the layers. Pretty card. Have fun at the event!!!! Beautiful card!!! 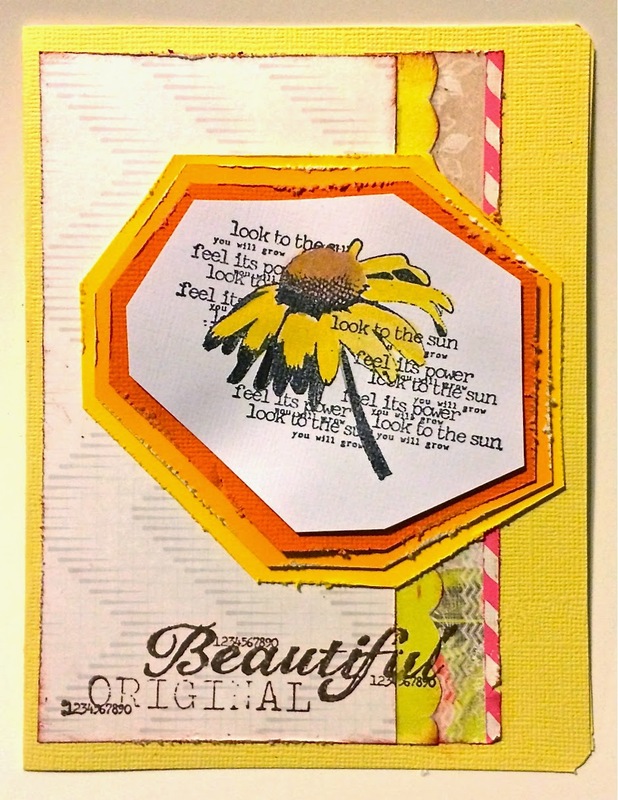 I adore that fun and fresh shaped and layered flower and the accent colors in your paper strips are fantastic! I love how you layered up the flower piece. Very nice! Have a fun weekend! Wow, simple but beautiful. Im sure it was NOT simple to make. I too am thankful for every day that the good Lord allows me to live! Great bright colours, and love the unusual shape of the layers! Thank you for reminding everyone to be thankful for all we have, family, friends, our hobby(our ability to be creative in our own way). Your card is very beautiful, thank you for sharing. Lovely project, Myra. 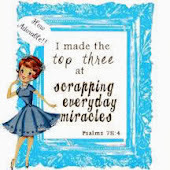 We should all be thankful each day for God's many blessings. It's good to say out loud sometimes too! Great colors and I like the stacked layers. You always do such creative work! Love the distressing. Beautiful card! Have fun at your scrapbook event! You have such great teachers!